Richmond, B.C., Canada-November 4, 2015. Corvus Energy, the industry leader in advanced lithium ion energy storage systems (ESS) for maritime hybrid and fully electric propulsion systems, announced the closing of a strategic investment from Statoil Technology Invest. Corvus technology powers more than 35 commercial hybrid and electric vessels around the world, with an installed-base totalling over 30 megawatt-hours. 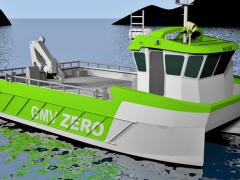 Vessels and equipment hybridized or fully electrified with the Corvus ESS, consume less fuel, operate more efficiently and effectively, and emit substantially less greenhouse gases. “We are building on our success in the offshore supply and service market where we have successfully demonstrated our technology is perfectly suited to the sector’s stringent performance, safety and operational requirements. Offshore supply vessels like the Viking Lady OSV and Edda Ferd PSV that employ the Corvus ESS are field-tested and proven to meet and exceed performance and safety expectations. These vessels run at peak efficiency for longer periods of time, saving fuel and maintenance costs and dramatically reducing emissions, “says Andrew Morden, President & CEO of Corvus Energy. “And now, with the release of new Class Rules pertaining to both Batteries and Dynamic Positioning (DP), Corvus’s ESS system will further enable the reduction in both the size and number of generator sets in vessels with DP operations. Vessels can operate more efficiently and consume far less fuel which is ultimately far better for our environment”, Morden added. “We are very pleased to invest in Corvus Energy, a recognized leader in large-scale energy storage systems for marine applications. Their products and unparalleled expertise give them a competitive advantage for expanding into the offshore sector. We see initial applications in vessels, with long term potential to apply the same technology to rigs and platforms, which will contribute to Statoil’s ambition to reduce CO2 emissions. This investment also represents an exciting opportunity to accelerate the growth of hybrid marine technology complementing Statoil’s increased focus on alternative energy solutions,” said Richard Erskine, Managing Director of Statoil Technology Invest. Statoil is the largest operator on the Norwegian continental shelf, with 60% of the total production. Statoil is an international energy company with operations in 37 countries. Building on more than 40 years of experience from oil and gas production on the Norwegian continental shelf, they are committed to accommodating the world’s energy needs in a responsible manner, applying technology and creating innovative business solutions. They are headquartered in Stavanger, Norway with approximately 22,000 employees worldwide, and are listed on the New York and Oslo stock exchanges.